Fragrance & Beauty Outlet will unite multicultural artists to launch their first Semi-Annual Art Exhibit presenting a combination of Professional & up and coming artists of New York. What no other Fragrance store competitor has ever done before. 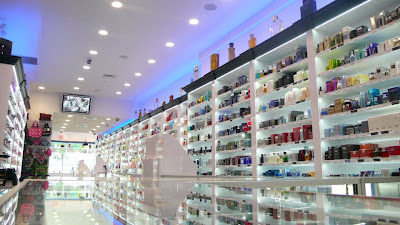 Fragrance & Beauty Outlet boasts New York's City's largest selection of discount designer fragrances. Its modern design and convenient location has made it the perfect venue for private events. After an extensive trial/selection process of submitted entries Fragrance & Beauty Outlet was able to narrow it down to the best Artists New York has to offer. It will be music, free gifts, added discounts on all fragrances & cosmetics, fine food, wine, great photo opportunity and more! Exhibit begins at 6pm. A $5 minimum suggested donation is kindly asked of all guests. Join Top Shop for the Ultimate Prom Party! Come along to the Topshop store on Broadway and Broome, NY because they are celebrating the magic of prom for one night only . Enjoy on the night talks about prom style by Teen Vogue’s Senior Fashion Market Editor, Mary Kate Stei nmiller, plus the Topshop Personal Shopping team will be ready to help you find your fantasy prom outfit. Plus make the most of 20% discount on everything, all night! - Hold Tight: Top Shop willl be giving away a limited edition glitter purse with all purchases of $100 or more (perfect for completing your prom ensemble). - Good Enough To Eat: there will be delicious mocktails and sweet treats on offer throughout the night. - Belle of the Ball Beauty Bar: did somebody say makeover? Enjoy complimentary hair styling, mini-manicures and makeover sessions to get you ready for prom. - Stylish Sounds: fashionable girl-about-town Harley Viera Newton will be on the decks to keep you entertained. Tell all your friends and be sure to join in the fun. Samos, the Greek island in the eastern Aegean Sea is historically known for its Muscat Blanc a Petits Grains grapes that are grown at 2,600 feet above sea level. Muscat of Samos comes in 3 styles: 1. Samos Doux, the vin de liqueur, made my adding alcohol immediately after the grapes have been pressed 2. Samos Vin Doux Naturel made by stopping the fermentation later on 3. Samos Nectar, the finest of the three, made from grapes dried in the sun so they can ferment into a wine of 14% alcohol. It's aged for 3 years in cask. 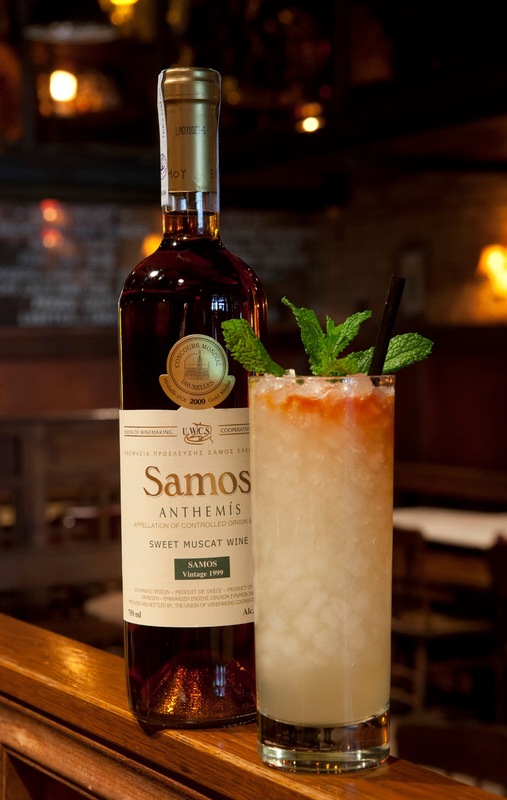 Muscat of Samos is aromatic, with delicate floral and grapey notes and a delicious sweet finish, therefore is the perfect base for unique and complex cocktails. The Anthemis Cocktail was created by Macao Trading co-owner and bartender Dushan Zaric. In the bottom of the mixing glass muddle the grapes into a paste, extracting all juices and tannins. Add the Pisco and Samos Anthemis 1999. Squeeze the juice from the lemon wedge and drop it into the drink. Add large, cold ice and shake briefly and vigorously. Strain into a pellet ice filled Collins glass and top with Ginger Beer. Dash the bitters on top and garnish with a crown of mint. Picture a bakery where imagination is the main ingredient. In Patti Paige's kitchen, artisans form their own cookie cutters and mix custom icings for delectable handmade treats. You can taste the love in Gisella Civale's locally made Italian antipasti. It combines fresh seasonal vegetables with heirloom recipes, all inspired by her Grandmother Maria's victory garden. Say good morning to sweet and salty pleasure! This crunchy, wholesome granola is baked in tiny batches by Nekisia Davis, using all-natural grains, pure olive oils – and lots of love. Brooklyn baker Emily Sigall combines creative artistry with a love of all things sweet. Her cookies are handcrafted using the best ingredients from organic and artisanal purveyors. Discover luscious pound cakes and shortbreads from a whimsical Japanese dessert bar where artisans use tofu to create award-winning sweet and savory treats. Taste the old-fashioned goodness of all-natural, hickory-smoked hams and handcrafted organic glazes from local artisans. A portion of every sale benefits programs that help fight hunger. One bite of Dawn Casale's handmade treats will explain why these nostalgic delights are called "whoopee pies". Taste two of her most luscious flavors: chocolate and pumpkin. NYC legend has it that everything's better with bacon – especially The Redhead's famous peanut brittle. This savory-sweet treat is made with a combo of bacon, nuts, maple syrup and spices. Savor the luscious art and soul of Sherri Adler's handmade Belgian chocolate mini pops and cupcake toppers, all decorated with colorful images inspired by vintage textiles, wallpapers and greeting cards. Explore the flavors of Vietnam as you taste a medley of Southeast Asian dipping sauces. They're made in Brooklyn with lots of love and the finest local ingredients. 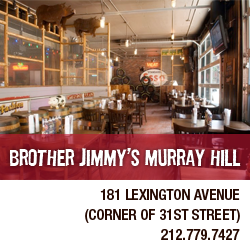 This Thursday, April 5th join Brother Jimmy's Murray Hill for tweet 4 meat launch party location for 2 free hours of open bar of happy hour specials! What: bud and bud light drafts, natty's, pbr's, and high life bottles and margaritas!